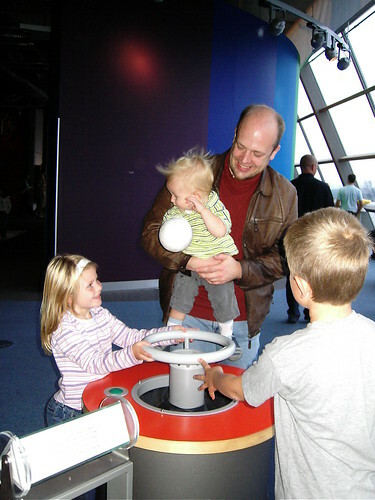 At the Science Centre, a photo by viralbus on Flickr. It is strange how perspective can change things. Thomas said something to me around new year that blew me away. He mentioned that Léon and Anna were now the age Marcel and Charlotte had been when we got together. When Thomas and I became a couple I would have described my family as comprising of two fairly big, mature and quite independent kids and a baby. Now I have a son who'll be 17 on his birthday, and a daughter who is 14, if you asked me to describe Léon and Anna I'd probably say they were still very small children, very much in need of my care and guidance in all things. It is very difficult to see each of your children in isolation and to remember what they were like at specific points in their past. The trick is to analyse the stage they are at without placing too much emphasis on their position relative to other family members and that is not simple. I hope I won't turn into one of these parents who keeps the youngest home even at 15 'because she is the baby'!